The aim of Dog Training for People is to help people build a long-lasting and trusting bond with their dog. 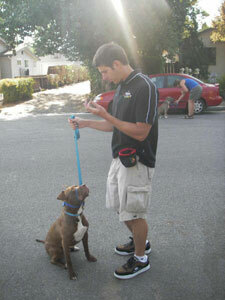 At the same time, clients gain the ability to have good control over their dog using positive reinforcement methods. Training is done in real-life settings to help your dog perform desireable behaviors in those specific situations where he may be having difficulty. If dog-to-dog aggression is an issue for you, we can help make a potentially dangerous situation very manageable. Canine Good Citizen (CGC) testing is available by appointment. If your dog is not ready for the CGC test, CGC classes are also available. Private consultations are available throughout the South SF Bay Area by appointment. © 2010 Dog Training for People. Website design by Stephanie Lam.